The SUNY New Paltz Facilities Management Department has announced the completion of Mohonk Walk West, which is now open for use by students, faculty and staff of the College. This new walkway will serve to connect Old Main, Humanities and Jacobsen Faculty Tower (JFT) to van den Berg Hall (VH), further integrating the home of the School of Business with the academic core of campus and making passage to VH safer and more convenient. Mohonk Walk West is the final product of a comprehensive landscape renovation project that began in 2009, when Facilities Management first entered into a design contract with Sasaki Associates, Inc. Construction of Mohonk Walk West was contracted with Ben Ciccone, Inc. of Poughkeepsie, N.Y. and got underway in the spring of 2015. The new walkway will serve to extend Mohonk Walk East and establish a line of unbroken pedestrian conveyance from the Route 32 Transit Hub down to Mohonk Avenue, VH and Hasbrouck Park. 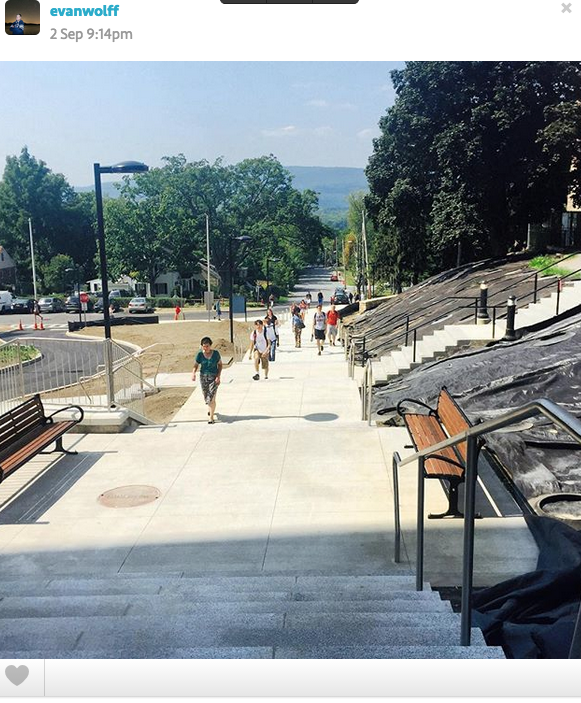 While the slope of the hill behind JFT necessitated the installation of stairs rather than ramps, throughout construction of the walkway every effort was made to make it as safe and accessible to as many campus community members as possible. To that end Mohonk Walk West has been fitted with an underground heating system beneath the new stairway and the sloped sidewalk along Mohonk Avenue. 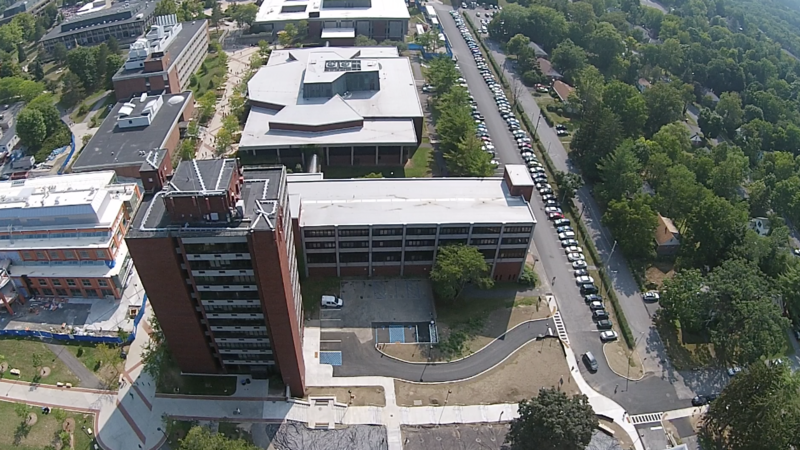 “The most noted benefit of the Mohonk West project is that we now have an established, safe pedestrian thoroughfare between the academic core of the SUNY New Paltz campus and van den Berg Hall, complete with radiant heat that will prevent ice buildup in the winter months,” said John McEnrue, director of Facilities Design & Construction. Aesthetic improvements to the walkway, including adjacent plantings, will be installed in short order. 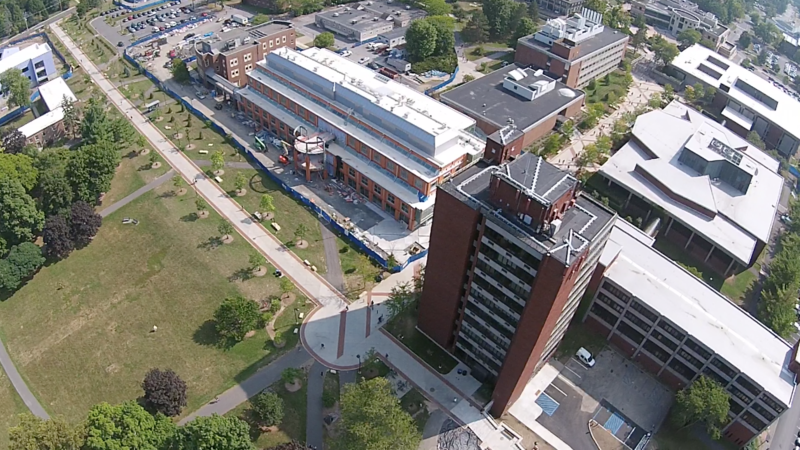 More information about campus construction and renovation projects can be found online.